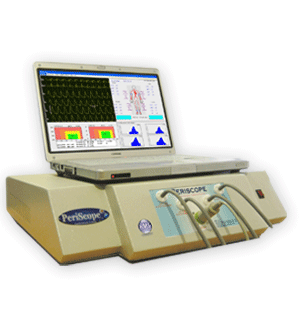 PeriScope is a PC based Cardiovascular Analysis System that uses simultaneous Non Invasive Blood Pressure measurements from four limbs and ECG waveform to calculate important parameters like Pulse Wave Velocity (PWV), Arterial Stiffness Index (ASI), Ankle Brachial Index (ABI), Central Aortic Pressure Values and Ejection Slope etc. for early prognosis of any CVD, CKD, HTN, DM and Neuropathy etc. Research has established these parameters as independent predictors of Atheroscelrosis, CVD, ESRD, HTN, Neuropathy, Retinopathy and Erectile Dysfunction. The equipment has been validated for repeatability and reproducibility of results. A research paper “Validity and reproducibility of arterial Pulse Wave Velocity measurement using a new device with oscillometric technique: a pilot study” has been published in the international journal, Biomedical Engineering Online. It may be found here. PeriScope has undergone extensive clinical trials on normal subjects and patients with CAD, HTN, DM, CKD, RA etc. One of the major trial was carried out on nearly 4000 subjects. It has established a strong link between Arterial Stiffness and CVD of various kinds. This original research article can be viewed at Indian Journal of Pharmacology (IJP) website. A study has also been conducted to compare the Central Aortic Pressure parameter measurements by Periscope with values from another device using ‘applanation tonometry’. This study establishes a good correlation and agreement in results of both the devices as per BHS and AAMI protocols. During this study the Central Aortic Pressure parameter values obtained non invasively by Periscope were also compared with those obtained invasively in a cathlab using catheters. These values were also found to be correlating. This research article by Dr.M.U.R.Naidu and C.Prabhakar Reddy can also be downloaded from IJP website. Another major study has also been conducted on normal subjects and patients having controlled or uncontrolled Hypertension. This is a milestone study in Cardiology in India, which proves that Arterial Stiffness measurement and management is an essential part of Anti-Hypertensive therapy. This research article can be viewed here online. The editorial article in the journal of Clinical and Preventive Cardiology January 2012, with international perspective and South Asian focus emphasizes the role of Arterial Stiffness measurement, management and monitoring in patients as well as asymptomatic general population. It also reveals the role of Periscope test as a counter-check mechanism for the treating physician to monitor drug therapy. Pulse Pressure wave forms of all limbs with quality control for validation of test. Software includes Farmingham Risk Analysis and Edinburgh claudication questionnaire.